Our ace reporter Royce Fish forwarded this picture that he received from George Eptamenitis. 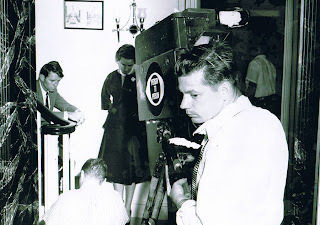 This was taken in 1955 for the Douglas Edwards 6pm network news. 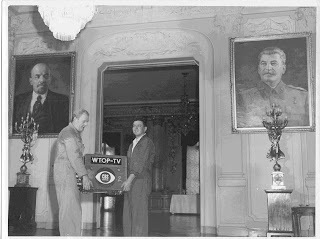 George thinks it was the first time the Russians allowed American TV into their embassy. The reason was that Khruschev had just finished touring the USA. George is the WTOP engineer on the right and John Mercer is the handsome engineer on the left. Royce Fish certainly has a cache of great material. Wonder if he has any shots of me from the over 25 years we worked together. By the way, the cameraman in the Person to Person shot has to be Norm Hannen.